© 2010 Your Life & Times. All Rights Reserved. Books & Life Stories are surprisingly manageable projects when Your Life & Times provides professional guidance and technical services. Whether you need minimal assistance or prefer that I manage the entire process for you, you’ll find that it is extremely satisfying to have your family’s stories or your own life’s experiences captured on the printed page. 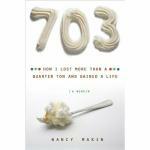 703: I assisted in the development of this fascinating memoir which details the author’s amazing loss of over 530 pounds. Over the course of more than 8 months, we worked on story flow and continuity and I edited for sentence structure, clarity, and brevity. 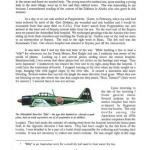 A naturally gifted writer, the author needed my assistance primarily with organization and editing. 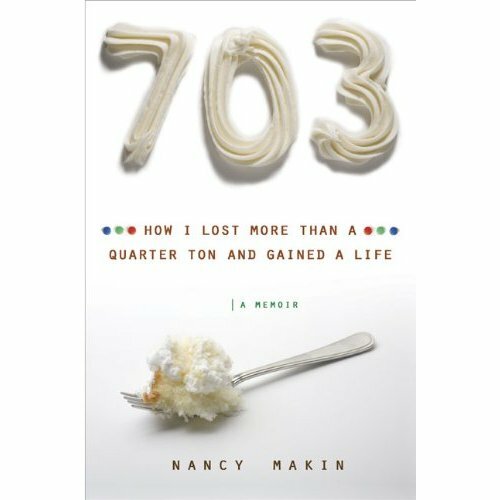 While this author had a book deal with a major publishing house, printing and binding options are now varied and increasingly affordable for the casual memoirist, even for just one or two copies. Photo slideshow DVDs are a simple way to show a variety of photos or to capture a sequence of photos grouped around an individual, family group, event, or concept. These items are often used as tributes on the occasion of a retirement, for the bride and groom on the occasion of their engagement or marriage, for birthdays, anniversaries, and are especially moving as memorial tributes. 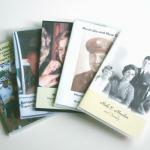 Slideshow DVDs can include music, narration, special effects and transitions, title pages, credits, captions, and more. A great way to use slideshow DVDs is to center them around a theme, such as family vacations, and show a few images from each vacation over a span of years or even decades. These slideshows are also especially fascinating when combined with audio from another source or from home movies or videos, and text overlays that provide additional information and detail. Using still shots, home movies, video, voice, and music, slideshow DVDs can pull together the best of your old media and make it relevant all over again. 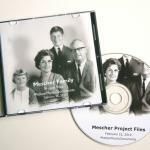 Picture CDs are a nice way of archiving your digital images and they make great gifts for friends and family. Images are scanned, organized and named or tagged, cropped, corrected for color, contrast and brightness, and (for an additional fee) repaired and restored. 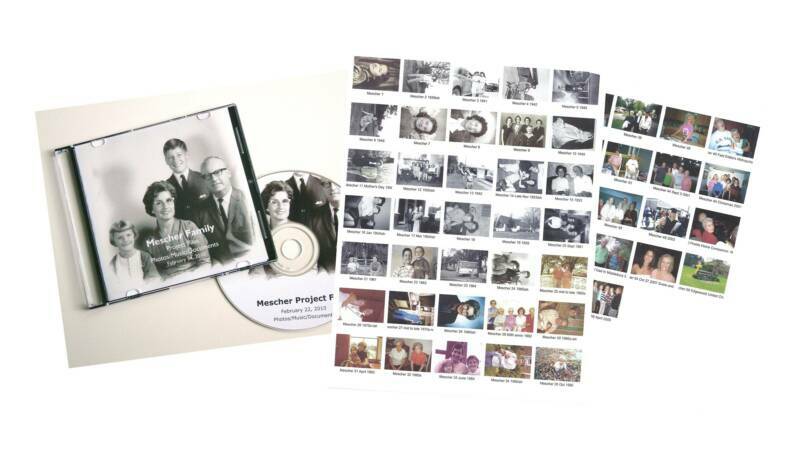 Each CD contains a file of the original scans or images, a file of the edited scans or images, and comes in a personalized case with a custom label. Audio CDs are today’s reel-to-reel and cassette tapes but easier to listen to and share. 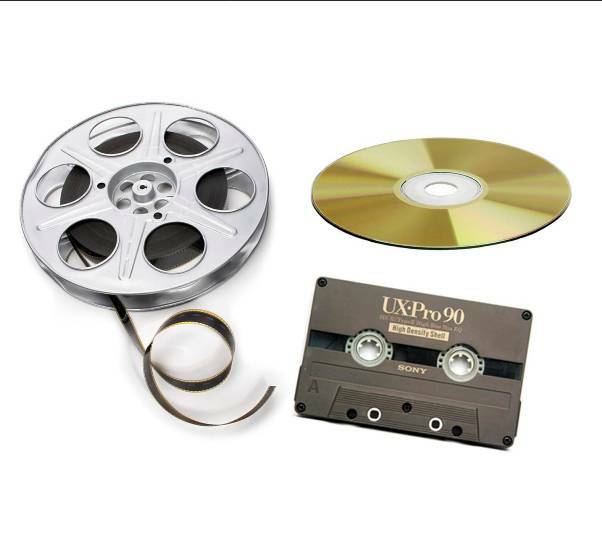 We’ll convert your old recordings to digital and then burn them to CDs or transfer them to a storage device for you to listen to and share with others. You can even listen to them on your MP3 player! 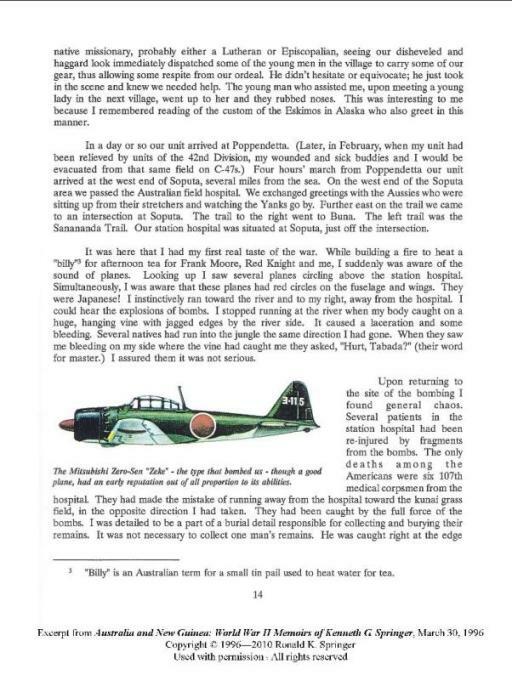 Click above to listen to an excerpt of an oral history I did in 1976. This sample is in video format so you can see pictures of the two primary people mentioned. Photo Collages are single pages that display as many as 16 images. Photos can be of an individual, family, or event, chronological or random, and color or black and white, or even a combination. They range in size from 8.5" x 11" up to poster size of 24" x 30" or larger framed and can be framed or mounted on poster board or foam core. A Legend (see center image when you click on the thumbnail to the left) can also be created with captions or details about each photo. Photo collages are an especially effective way to show a person's life progression through time. Biographical Sketches are single pages that detail essential information about an individual such as birth, baptism, education, marriage, career, family and death. 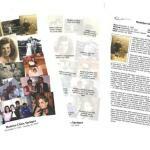 These simple pages are packed with vital statistics and invaluable information for future generations and, when combined with other bio pages, make a great foundation for a family history. If you’ve thought that you don’t know much about a family member or ancestor, you might be surprised at how much information we can pull together. 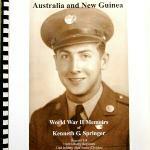 Photo Collages and Biographical Sketches are simple, quick and affordable, and a great way to start a personal or family history project. 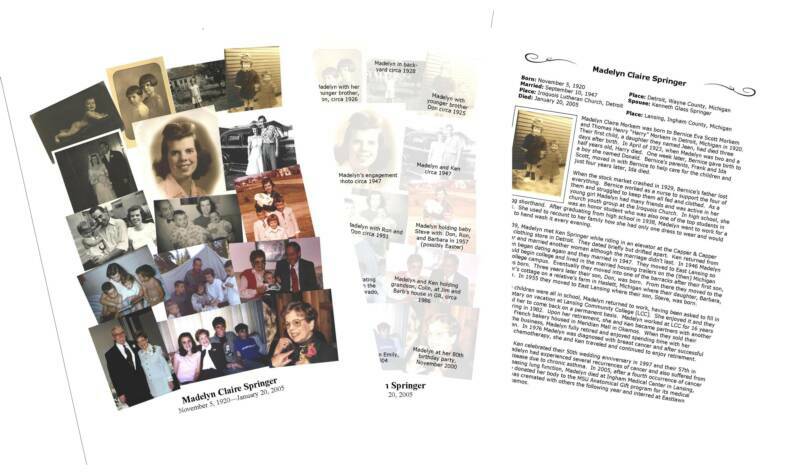 Completing these pages for all of your grandparents and your parents gives you the foundation for a family history that can easily be filled in with more photos, family stories, and memories as well as details of your own life. Specialty Items include such things as Heirloom Recipes and Family Cookbooks, which can showcase one favorite family recipe along with a story about it, or a compilation of family favorites with pictures and stories. 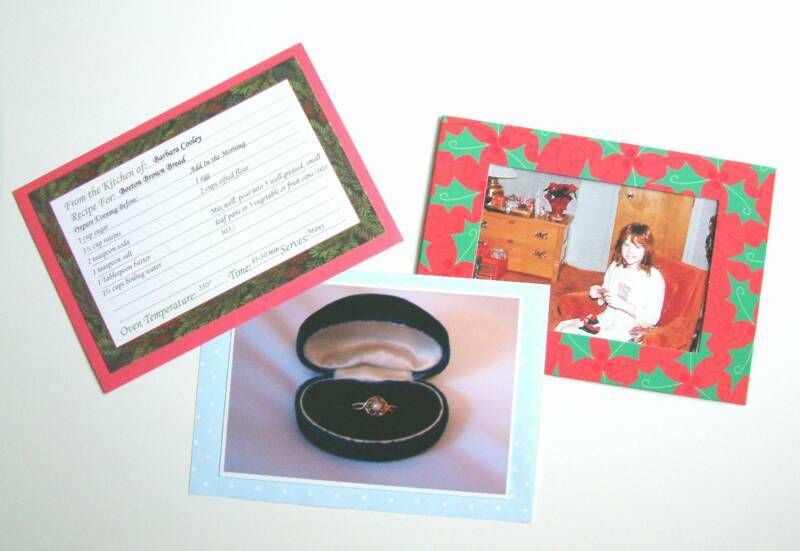 Another favorite is the Heirloom Gift and Bequest Cards which feature photos of the items along with a description and the story behind the item, such as Grandma’s pearl ring given to her by her father. 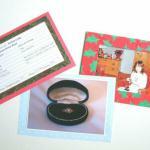 Heirloom Photo Memories are a quick and simple way to capture a moment in time with a picture and its story, such as a first Christmas together. The possibilities are varied and unlimited—let’s talk about what you’d like. 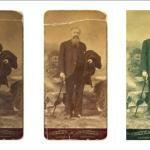 Photo Editing and Restoration has changed dramatically in recent years and is now much quicker and more affordable. 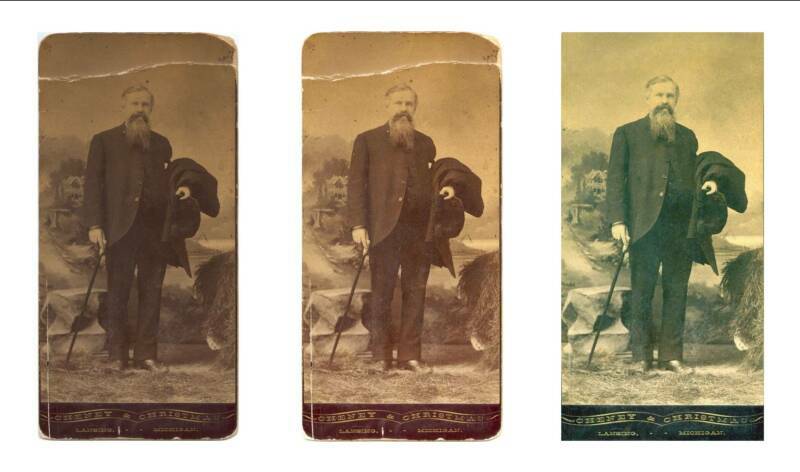 When I scan or photograph your old or damaged pictures, I also crop them as needed, correct for color, brightness and contrast, and adjust the mid-tones (see center photo.) These services are included in my basic fee for photo scanning. For an additional fee I can also repair cracks and tears (see right photo) as well as water or mildew damage, and even replace missing sections. Digital Conversion Services will save your old home movies, audio and video tapes from deterioration and obsolescence, and enable you to enjoy them all over again in today’s formats. Convert those old Super 8 or 16 mm movies into digital video for easier sharing—you could even upload them to YouTube for relatives and friends around the world to enjoy! 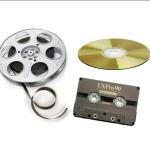 Convert that cassette or reel-to-reel tape of the family sing-along and use it as the soundtrack for a family slideshow. Digital conversion is affordable and prevents permanent loss through breakage, mold and mildew, pollution, light and dust, or lack of necessary equipment to play them. Your Life & Times will help you preserve those memories! As always, great care is taken with your precious items. This sample is a clip from the first oral history I ever did. In the spring of 1976 I sat at the kitchen table with my grandmother and asked her questions about her childhood and life “in the olden days.” What a treasure it is to have this recording these many years later.